Roederer Correctional Complex is located in LaGrange Kentucky, part of Oldham County. It serves the department of corrections in several ways, primarily by acting as an intake assessment and classification center that processes all adult males in the state (except for Death Row inmates). The prison is also home to over 100 inmates who provide support services for the facility in areas like laundry, maintenance and food services. Roederer Correctional Complex also provides a substance abuse treatment program that treats both incarcerated inmates and those on parole supervision. While only about 172 inmates are housed permanently at this prison, it can house up to 1,002 inmates due to it acting as an intake hub for Kentucky. 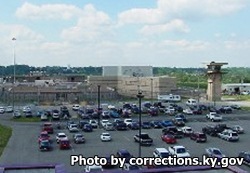 GED courses are available at this prison as well as vocational classes in horticulture. Offenders who are nearing the end of their sentence can participate in a pre-release program which prepages them for the transition back into society. Visiting occurs on Saturdays and Sundays from 8:30am-3pm, you must arrive by 2pm to be admitted to visitation. Inmates are only allowed one visit per week, and the day they are allowed (either Saturday or Sunday) is determined by the last number of the inmate's ID number. If it is an even number the inmate can have visits on Saturdays only in February, April, June, August, October and December, and Sunday visits in January, March, May, July, September and November. If the inmates ID number ends in an odd digit they will have Saturday visits in January, March, May, July, September, November, and Sunday visits in February, April, June, August, October and December. For more information on the visiting times click here.